I finished a piece of clothing! 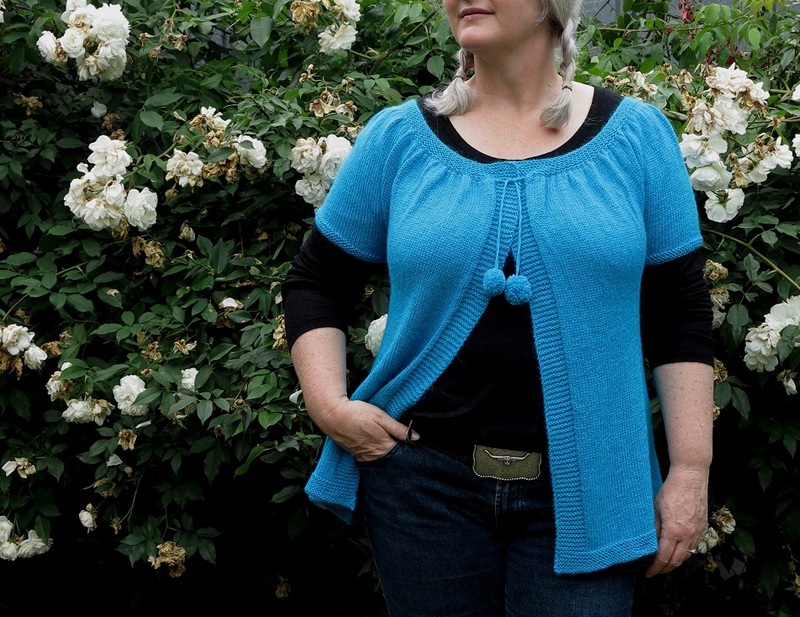 A real deal wearable cardy… that I love! It’s a bit amazing… you see I’ve started a few over the years but never quite finished them. And by started, I don’t mean a lame go at the band or something… I mean made the front, back, and one sleeve on one of them! But then something always happens… bored, yarn issues, get distracted with multiple other projects, make a HUGE mistake… and I don’t finish them. It used to be the cycle of a lot of my crafty endeavours… start stuff but not finish. Now I’m hellbent on finishing what I start… to the point where I’ll sit up knitting until 2 am to finish it because I’m so damn excited that I’m about to finish something! #crazycrafter! I first spotted this cardy on IG via the lovely Corrie from Retro Mummy. 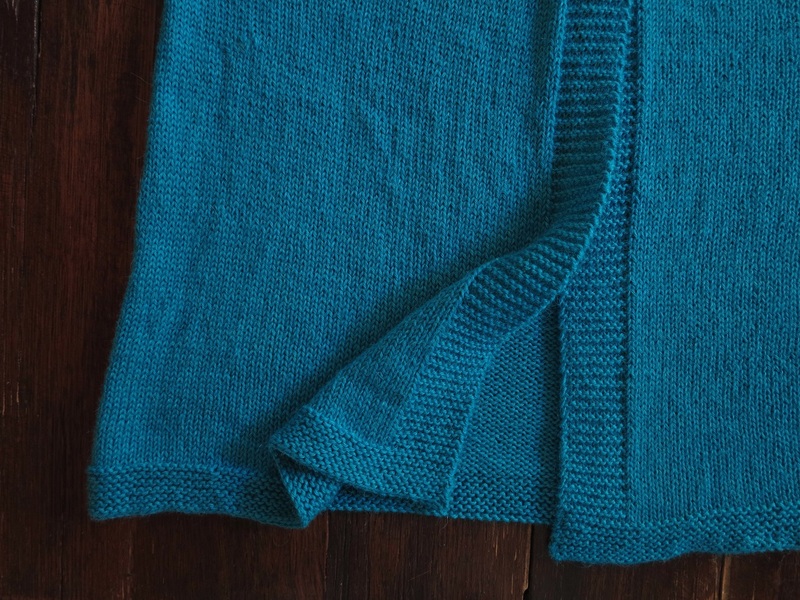 It’s called a Kina cardy and Corrie was knitting a gorgeous kiddie version, but you can find the free pattern for the adult version on Ravelry here. 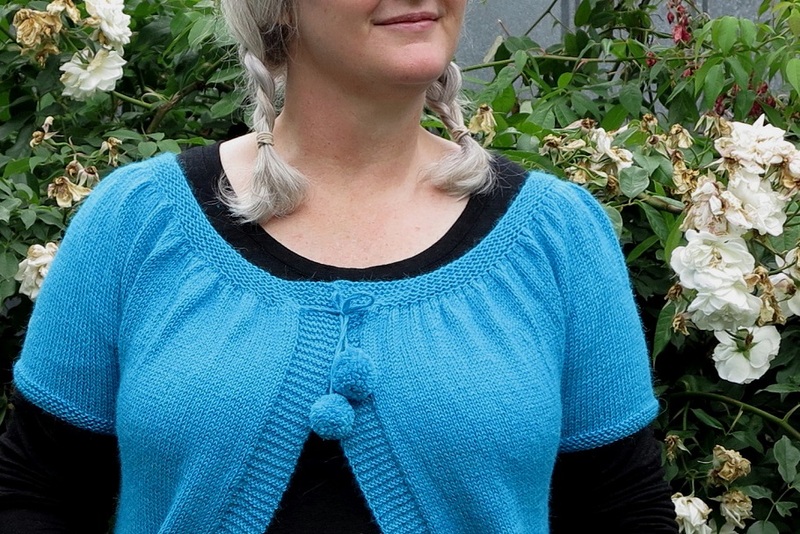 It’s a very easy simple pattern to follow, great for a beginner pattern follower (moi! ), as it’s knitted from the top down in one piece. I made a couple of tweaks … of course… I extended the sleeves a smidge… I also made it a little bit longer overall and of course I popped some Pom Poms on it. I’ve yet to add the button at the top as the Pom Poms are more decorative than functional. This is the first thing I’ve knitted with my stash of pure baby alpaca yarn I stuffed into my carry on suitcase, sat on it to close it, and carried it back all the way from Cusco! Man that suitcase was stuffed full, and there were more bags (of 10 x 50gm balls!!!) stuffed in our regular big suitcases too. I was only slightly embarrassed when they had to open my luggage at one of the many airport security checks, and sheepishly mumbled ‘yes I like to knit and crochet a bit’. All I can say is it was so worth it. The yarn is exceptional quality and so soft and light and fluffy and warm. As you can see by the different colours in the photos, it was really difficult to capture the true colour of this yarn. Turquoise just wants to break my camera for some reason. It looks blue in the photos but it’s true colour is closer to this last photo. 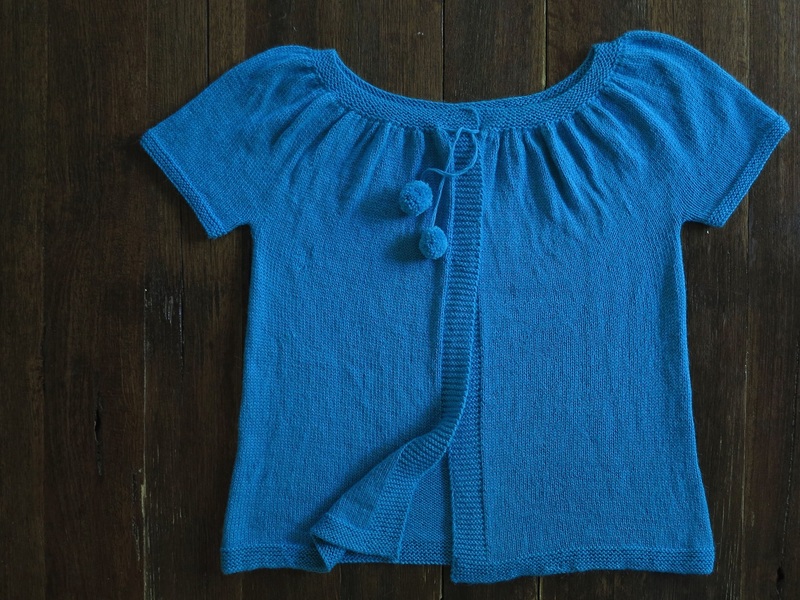 I think knitting yourself a piece of clothing is a huge leap of faith. What if you get to the end of it and it looks crap on? And what do you do when you make a mistake? Unpicking Knitting is hard, unlike the forgiveness of Crochet. But I’ve got to say, the satisfaction of making something that I can actually wear is huge. So give it a go… if you haven’t already… you don’t have to be an expert. Take that leap of faith… cross your fingers it will fit… and look ok… and if you do have to unpick, my best advice is to do it slowly… whilst eating chocolate. Wishing you proud I made it moments and coolish summer days so you can wear your knitted goodies! PS: Yes I probably should have dead-headed the rose bush behind me for a prettier backdrop… but you know… I like my gardens wild and rambling (reads: ‘slightly’ unkempt). This entry was posted in craft, inspiration, knit, pattern, Photography and tagged alpaca, baby alpaca, free pattern, kina cardy, knit, knitting, pattern, photography, pure baby alpaca, travel. Bookmark the permalink. It’s gorgeous! And the color is stunning on you. Great job. Oh yes, I can work on projects for ages too… I think aiming for next winter on your scarf is perfect and you’ll be so pleased you kept plugging away at it when a chilly day comes along and you can wrap yourself in a warm scarf you’ve made! Thanks for popping in. This is lovely – and the pom-poms are such a fun touch! You knitted that!?! Wow, it looks so beautiful (I say that because for some reason I wasn’t given the sewing/knitting gene in our family so I know the work that would go into your gorgeous cardie) great work.